Hello, everybody! Long time no see! Sorry for the lack of regular posting lately... I'm smack in the middle of law school finals and my time is at a minimum. The good thing is that I'm nearly done, so I'll be returning to my regular posting schedule shortly. 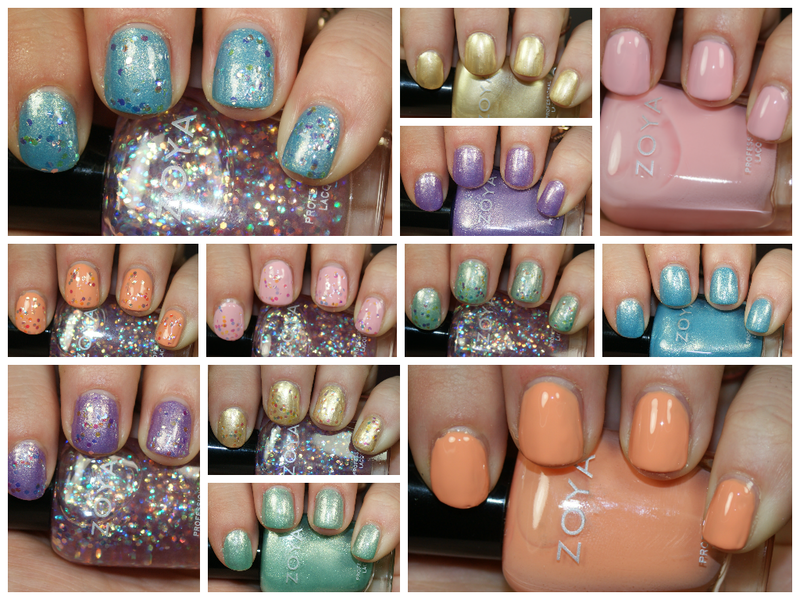 Today I have for you the Zoya Awaken Collection for Spring 2014. Brooklyn is a gold metallic polish that is a little on the frosty side. While the shade itself is pretty, it does show your brushstrokes if you're not careful. But those brushstrokes are fairly easily hidden if you use Monet over it. I am, however, super excited that Zoya named a polish Brooklyn, as that's the city I was born in! Cole is a peach cream polish that is full coverage with three coats. I liked how well this color built up on my nails and it's nicely pigmented, too. You can see just how well it picks up Monet on the nail. Dillon is a mint green metallic with silver shimmer, opaque in two thin coats. I really loved how this shade looks with Monet, as it takes on a bit of a holographic appearance and really plays well off the glitter! Dot is a pink petal cream that was relatively opaque with three coats. I say relatively because you can see that it's a bit streaky, no matter how careful I was. But this is a great shade to wear as an undercoat for glitter, like you see with Monet. Hudson is an orchid metallic with silver shimmer, which is very in for 2014 because orchid is Pantone's color of the year. Not only is purple my favorite color, but this is my favorite color of the spring and positively sings with Monet on top. Last, but certainly not least, is Rebel, a sky blue metallic with silver shimmer. This comes in a SUPER close second to Hudson and it's just gorgeous. It's delicate, but bright at the same time, and looks fantastic with Hudson. Three coats were used with the two cremes, two coats with the rest. Overall, I think this was a very nice Spring collection that reminded me a lot of Easter. Monet is a versatile topper for pastels that I adore. Hudson and Rebel are clearly my favorites, but Dillon isn't too far behind. The entire Awaken collection is available at Zoya.com for $9 per bottle, while Monet is available for $10. You can also find Zoya at your local Ulta store. Are you going to be picking up any of the Awaken shades? And do you love Hudson and Rebel as much as I do? I love this collection!! I've worn these polishes so much already. Hudson is my favorite of this collection too!